Despite the issues with the previous round, DPCC has asked me to go ahead and post the semi-final as the judges have decided to host it regardless of the outcome. If all four competitors post, there will be an elimination, and if not Scott, Brett, and Blake will all proceed to the semi-final round. This will be decided tomorrow. In this challenge, you are responsible for designed an entire themed area of your park. You may choose any of the areas pitched in your original audition proposal, or you may design a substitute land for one of them. Whatever you propose in this proposal must appear in the final park proposal as pitched, so be sure you've got everything exactly how you want it before submitting. What are the themed land requirements? Anything previously pitched for the area should be mentioned in your proposal as well, but it will not count toward the minimum requirements. In addition to the basic requirements, one of your land's attractions must be a "landmark" attraction. This should be the biggest and best E-ticket in your park that has not been the subject of a previous proposal. You may create any type of attraction (dark rides, flume rides, roller coasters, simulators, etc. are all acceptable, as are live shows and other non-ride attractions), but your attraction must be a primary reason to visit the park. Due to delays in posting this challenge, the deadline has been extended to Monday, March 16th, at Midnight. If all three competitors post sooner, we will end this challenge early to give you more time on the Final round. Good luck to our remaining competitors in this challenge! You have proven yourselves in this competition, but you now face your toughest challenge yet. Thanks for posting AJ, and great job with it! Be ready to go hard or go home. If you haven't been using images, start using them. Think about how your entry is structured and make sure it all flows consistently. If you're using the area to tell a story, make sure you're explaining the story. Lastly, if you haven't already, look at previous contests, see what works, what doesn't, and follow that. I hope I'm not jumping the gun here, but assuming that Blake, Brett and I do indeed move on into the semi-final round, and since Chad did encourage the use of images, could I request an increase in the number of images we can use? This challenge is a lot bigger than any earlier challenge, and it would help me (and I assume the other two competitors, but I'm not speaking for them, just me) if I could use some more images than the 7 total right now (1 title, 1 closer, and 5 in the body of the proposal). I would leave that up to the judges to decide yes or no, and if yes how many more we can use (cough, cough, unlimited, cough, cough). We have decided to take Scott's suggestion and increase the maximum number of pictures to 10 body pictures for the round. There will be an even greater increase for the final round, but we have yet to decide on it. Thanks! I just want to be sure I understand what you mean by "body pictures" (other than human body :+) Do you mean ten pictures total, or ten pictures in the proposal AND a "cover" and "closing" image? I assume that the same rule about replacing one image with a video applies. Yes the same rule would apply. And I meant 10 images, plus the cover and closing pictures. Sorry for the confusion! Also, contestants will recieve 2 separate rankings. One for your headline attraction, and one for your land, so make sure both count! Any more changes in the rules and challenge before we post? No. I'm sorry to post that so late, but there was a lot of discussion figuring out exactly how to do it. 1898 was a historic year for Americana County. In that year, after decades of the State Fair being held in various temporary locations throughout the state, the decision was made to find a permanent location for the fair. Several cities and counties lobbied for the honor, but it was soon obvious that the best location by far was on the site of the Americana County Fair, the largest and finest county fair in the entire American South, and thus the former "County Fair" in Americana 1900 became "State Fair". Guests visiting "State Fair" Township will only see part of the huge state fair site, but what they will see and be able to enjoy is the heart of the fair, the State Fair Midway, with rides for the entire family, games of skill, wonderful foods and unique shopping and entertainment, all in an atmosphere of excitement and family fun. The fluttering of flags and banners, the twinkling of lights on the amusement rides, the delicious smells from the restaurants and candy stands, and the sounds of the carousel organ and barkers at their games all carry guests back to their childhood, when a visit to the fair was the highlight of their summer. State Fair can be entered from three other Townships: The Pike, Courthouse Square and from Morrison Farm via a road from the Mill Pond. Each entrance is made under an elaborate archway designed to appear as if it was constructed of sheaves of wheat, ears of corn, cotton bolls and other horticultural products of the state. Around the base of these archways, and throughout the entire Township, are beautiful gardens of flowers, decorative vegetables such as cabbages and kale, and even crops such as corn, wheat and cotton. Also on display around the fairgrounds are examples of historic agricultural equipment, such as the latest 1905 steam-powered tractor and horse-drawn plows. These gardens and historic displays are a subtle reminder to guests that this is a State Fair, and that agriculture is what made this fair possible. The heart and soul of any State Fair Midway are the rides, and this Midway contains a dozen of the most memorable, most traditional and most unique amusement rides ever assembled. While a few of these rides might have been introduced a few years later than the approximate theme dates of Americana 1900 (1890-1910) they all are absolutely appropriate for a state fair midway based on Americana's theme. One thing that is different about them is that these are not the temporary rides that appear at many fairs for a week or so, then are dismantled and moved to another fair for another week. These rides are permanent installations, carefully themed to add to the visual impact and beauty of this Township, expertly maintained and operated, and guaranteed to provide fun, thrills and excitement to fairgoers of all ages. Dominating the entire northern portion of the fairgrounds is one of the most beautiful wooden roller coasters in America- "Thunderbolt and Lightning", an RMC coaster with a dual personality. It- or perhaps I should say they- are not racing coasters or dueling coasters. They are "mirror coasters", closely following the same layout as each other but in reverse, and doing so while intertwining their tracks and wooden supports. The massive wooden structure of "Thunderbolt and Lightning", painted a dazzling white with yellow, orange and red lightning bolt details, towers over the loading station, a wooden pavilion with white columns and a red roof topped with two cupolas. This loading station serves both coasters, but has separate side-by-side entrances for each coaster. The lift hill for "Thunderbolt" rises to the left (north) and the hill for "Lightning" climbs to the right (south). At the top of the 140 ft. hills the trains plummet down a 59 degree descent, bank sharply (to the right for "Thunderbolt", left for "Lightning") and from there on the trains race through the twists, turns and hills of this breathtaking coaster, passing each other often, mimicking each other's movements in an amazing achievement of coaster design. When the trains return to the station, the riders realize that "Thunderbolt and Lightning" IS very, very frightening- but also very, very fun! The station for these coasters is flanked on either side by food and snack stands, selling hand-spun cotton candy in multiple flavors, hand-pulled salt water taffy, soft drinks in such traditional flavors as Sarsaparilla and ginger beer, corn dogs (State Fair Brand, of course), freshly-cooked kettle corn, and other traditional and tasty foods, treats and beverages. 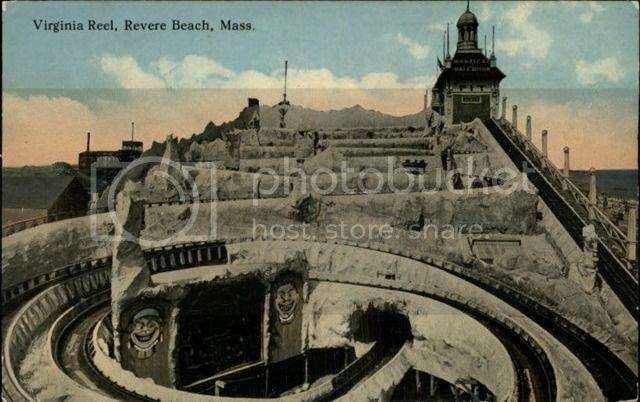 North of "Thunderbolt and Lightning" is an attraction that was a fixture of midways and amusement parks for decades, but is now almost forgotten- the "Tunnel of Love". In 1900 it would have been considered inappropriate for a young couple to be seen showing public signs of affection, but the Tunnel of Love was a way around this. It was an indoor dark ride, usually a boat ride, through either pastoral, romantic scenes or dark, scary scenes, both of which would give a young man and his female companion a reason to sit a little bit closer together than would be considered proper in public. Times have changed, but not the desire for two people in a relationship (or hoping to be in one) to sit a little bit closer together. The "Tunnel of Love" recreates the best of these early dark rides and carries riders back to that more romantic and innocent era, but is not intended only for romantic couples. Entire families will have fun discovering why their grandparents have such fond memories of this early dark ride. After boarding one of the "love boats" riders will first enter a heart-shaped tunnel that leads to a romantic, pastoral scene of green pastures, beautiful flowers and trees. Birds and squirrels (animatronic) will be seen playing in the trees, and rabbits will be running across the grass. The stream then carries the boat into a forest, a dark, scary forest, with frightening animal sounds, growls, glowing eyes staring at the riders from the darkness, and an occasional creature such as a wolf or wildcat suddenly jumping out at the riders, all meant to scare the riders into each others arms. Soon, though, the stream leaves the dark, scary forest behind and returns to another romantic pastoral scene, but this time it is a beautiful garden at night, with stars twinkling in the sky around a lover's moon. Lanterns hang from tree branches, lightning bugs dance through the flowers and romantic music of the era- perhaps "I Love You Truly" or "By the Light of the Silvery Moon"- will be heard softly from the romantic gazebo in the center of the garden. The boat enters another heart-shaped tunnel, lined with twinkling lights of red, pink and white, and returns the riders to the State Fair midway, having relived the romantic fun that their great-grandparents enjoyed so many years ago. And yes, they are all black. 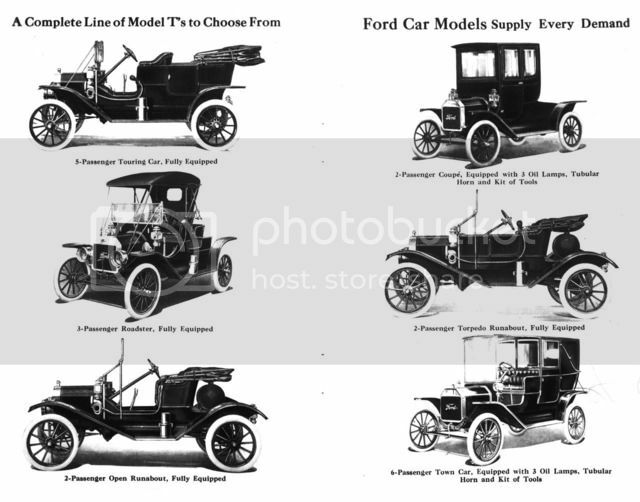 This is a test track to let "prospective purchasers" test drive the latest vehicles from the Ford Motor Company of Dearborn, Michigan. Guests can drive these carefully- detailed beauties on a landscaped route through a park-like setting of lawns, trees, flowers and elegant statuary, then enter a small town of the early 1900's. The cars, driven by the driver but guided by a rail to keep them on the road, pass several elegant homes, then enter the business district and drive down the Main Street of the town. After passing the "Grand Opening" of the Murphy & Sons Ford Dealership store, the Model Ts and their passengers return to the Test Track station, where after exiting their vehicles visitors can view original Ford Model T automobiles, beautifully restored and on display (unfortunately not for sale at their original price in 1910 of $900). Proceeding down the west side of State Fair brings visitors to a delightful toy store, "Teddy's Bear Fair", which commemorates the introduction of the teddy bear to the toy world in 1902. Here children of all ages will be able to find a vast selection of teddy bears, many of them recreations of the first teddy bears created by Morris Michtom and his Ideal Toy Company. Many styles, shapes and sizes of teddy bears are for sale here, but all of them are appropriate to the Americana 1900 era. No neon green pandas or Care Bears here! Also for sale here are wooden tops, marbles, checkers, toy cars and tractors, and many other traditional toys and games from America's past. Next to Teddy's Bear Fair is one of the most unique designs of roller coasters ever created, the "Virginia Reel". A predecessor of the modern spinning wild mouse, it was introduced in 1908 by Henry Elmer Riehl at Luna Park in Coney Island, New York and was named after his daughter, Luna Virginia Riehl. Riders board tub-shaped cars with seats facing the center of the tub, which then climbs up a chain lift hill to the top of the ride. 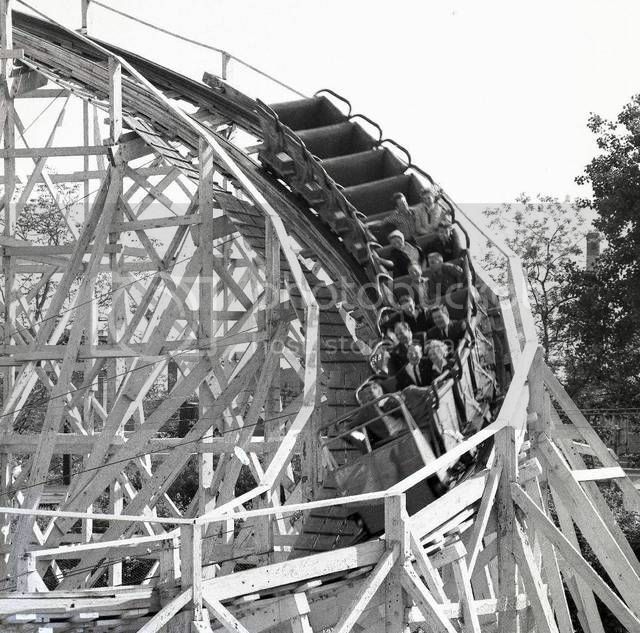 The Virginia Reel, constructed by Maurer AG of Germany (known for their outstanding Wild Mouse coasters), uses a flat-bottomed side-friction track that resembles a trench, and the tub revolves freely on the chassis as it descends down a series of unbanked turns and multiple switchbacks. The track carries riders careening down a rocky hillside, then plunges into an eerie cavern scene full of bats hanging from the ceiling while evil, glowing eyes peer at the riders from the darkness. The tub then emerges once again into daylight only to begin a hair-raising descent down an ever steeper series of helices before plunging down into another sinister underground lava cave where a rock monster rises from a lava pit and reaches for the tub and its riders. The riders narrowly escape the monster's stony claws and its deadly lair and return safely (if a little bit dizzy) to the loading station. The wildly-spinning tub, the back-and-forth path of the switchbacks, the surge of speed as the tub starts through the helices and the sudden plunges into the terrifying monster-filled caves makes this one of the most unusual and disorienting coaster experience to be found anywhere. The "Virginia Reel" is not a coaster to be ridden on a full stomach! "The Dodgems" are a slight anachronism at State Fair. They first started to appear at fairs and amusement parks in the 1920's- but who cares? They are among the most popular rides to be found at any theme park. The bumper cars at State Fair are beautifully designed for both safety and aesthetic appeal. Bumper cars from the early days of amusement rides and modern bumper cars are quite different in design when compared to each other, and they are probably much safer now than they were then. The State Fair dodgems will be designed for safety, but still will present beautifully crafted cars that will minimize risk and maximize fun and excitement. The sounds of the laughing riders, the sights of the flashing lights in the ceiling and the slight smell of ozone from the sparks where the car's pole touches the electric grid overhead make a ride on the Dodgems a sensory-filled trip back in time. and many other Southern specialties. Each menu item has listed after it on the menu the name of the cook whose recipe was used along with which state fair and what year the recipe won first place. Prices for appetizers average $7-$10, entrees from $15-$23, and desserts from $6-$8. A children's menu is available for an average price of $10/entree including beverage and dessert. The Blue Ribbon Restaurant is one of Americana 1900's most popular restaurants. The high-quality dishes, homey surroundings and relaxed atmosphere make it a must-do dining experience for visitors to State Fair. "Laff in the Dark" is a recreation of the popular dark ride of the same name that entertained generations of park visitors at Lake Compounce Park in Bristol, Ct. This is the penultimate cheezy dark ride, full of vampires, werewolves, witches and skeletons, sirens, strobe lights- and fun. Four person cars carry riders through a twisting, turning series of hallways and rooms, all in complete darkness, until lights suddenly come up on a rotted body, a ghoul or a scarecrow. The scares come from the element of surprise- riders become disoriented by the constantly twisting, turning car, and in the complete darkness of the ride they never know when they will come face-to face with a disembodied head or a vampire ready to grab them. More silly than scary, the monsters will first brings screams from the more vocal riders, then laughter from all- thus the name. Like the Dodgems, this ride is probably too late to have been in a state fair midway of the Americana 1900 era, but dark rides similar to it have been presented at fairs since the late 1800s, and "Laff in the Dark" serves as a tribute to those early pioneering rides that paved the way for the technological masterpieces of today. 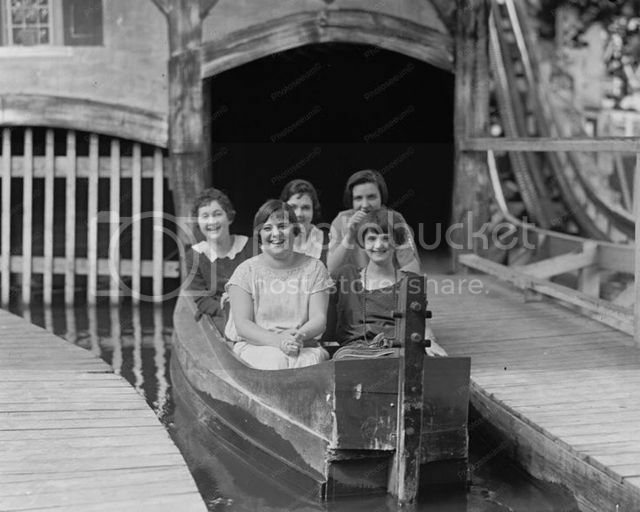 Perhaps by experiencing what dark rides were like in 1900, we can truly appreciate how far we have come. What is a fair without farm animals? While other farm animals (cows, chickens, sheep, etc.) are featured in the Morrison Farm Township at Americana 1900, here at State Fair the center stage is taken by the most important farm animal of that era, the horse. The intelligence, grace and strength of these noble creatures is demonstrated three times a day in a production full of spectacular horsemanship, pageantry and excitement. The south end of this side of State Fair is dominated by the State Fair Horse Arena, a 2,000 seat indoor arena with grandstand seating around three sides (the two long sides and one short) and a small stage on the fourth side. Entrances for the horses and performers are located at the four corners of the arena floor; entrances for the audience members are located throughout the seating area. The stage holds a four piece bluegrass band and space for announcers, singers and other performers. This horse show does not tell a story, but is a series of acts that demonstrate the strength, skills and intelligence of horses. It starts with a grand entrance of all the horses in the show, both to introduce them to the audience and to show how many sizes, breeds and colors of horses there are. From the tiny Falabella, which stand only about 5 to 6 hands high (hh), or 20-24 inches (each hh is 4 inches) and which are much too small to be ridden, through Shetland ponies (8-9 hh), Arabians (14-15 hh) and the massive Draft horses (19-20 hh), nearly two dozen horses are featured throughout the show. A demonstration of dressage demonstrates to audiences the amazing skill and intelligence that allows a horse and its rider to perform an almost ballet-like dance. Other riders bring a bit of the rodeo to the arena, with trick-riding and lassoing of barrels, while children will be fascinated by the sight of the tiny Falabella ponies from Argentina performing alongside their massive Draft horse cousins. The conclusion of this thirty-minute show brings all the horses and their riders back into the arena for a flag-waving, music-filled finale of the best horsemanship and horse talent ever brought to a theme park. The last attraction on this side of State Fair is the ever-popular Penny Arcade. The games found here are not the high-tech electronic games found in modern amusement parks, but the classic wooden pinball games, ball toss, the ever-popular "love test" and a collection of Cail-O-Scope machines. These hand-cranked, animated picture machines contained a reel of stereographic photos that, when a coin was inserted and the handle was cranked, the photos fell one by one in front of the viewer in which the operator looked. Many different subjects could be shown in these early movie machines, from such early news features as "The San Francisco Earthquake" and "The Great Regina Cyclone" to more risqué (and popular) titles such as "Naughty Marietta" (who never lived up to her anticipated naughtiness). The remarkable thing about this Penny Arcade is that, just like the sign says, all of these games cost only five cents! Intended more as an attraction rather than a money-maker, all money from these games is donated to "Give Kids the World". Across the main entrance to State Fair, on the west side of the Township, is the Grange Hall Barbeque. What is the Grange? Founded in 1867, its complete name is "The National Grange of the Order of Patrons of Husbandry." It was organized to promote families to "band together to promote the economic and political well-being of the community and agriculture." This fraternal organization of mostly farm families was extremely influential in promoting laws that benefited farmers and the entire agricultural community, but it was also a social organization for members to get together for friendship and fun. Many Granges held fund-raising meals, ice cream socials and other activities in their rural Grange Halls. The Grange Hall Barbeque welcomes State Fair visitors to one of these delicious meals. Served cafeteria-style, like most of these traditional Grange meals, guests take a tray, collect their silverware and napkins, and proceed down the serving line past an almost overwhelming selection of home-style foods: fresh dinner rolls, side dishes, salads, soups, desserts, all centered around the main feature- the selection of grilled and smoked meats being prepared outdoors on large charcoal grills beside the Grange Hall. All a visitor to Americana 1900 has to do is follow their nose towards the aroma of hams and beef briskets smoking in the wood-burning smokers, the chickens, steaks and sausages grilling, and the slabs of beef and pork ribs being prepared by skilled grill masters. As this is a cafeteria, with each item priced separately, the total price of a meal will vary depending on how strong willed a hungry diner is, but the average price of a full meal, including soup (who can skip a bowl of home-made chicken and noodles? ), entree (why get half a slab of ribs when you know you'll want more? ), two sides (green beans cooked with smoke-house bacon, and perhaps some of Widow Dawson's potato salad), a glass of Southern Peach Sweet Tea (free refills of course), and a piece of apple crumble pie ala mode (with home-made vanilla ice cream)...what was the question? Oh, yes, the price. $29.99. Prices may vary depending on your appetite and how many times you go back through the line for just one more piece of pie or a second helping of potato salad. Diners carry their heavily-laden trays from the cafeteria line into the main Grange Hall dining room, decorated with antique farming implements, prints of Grange announcements and patriotic portraits of all of America's Presidents from George Washington to William McKinley (the "current" President in 1900). Here plenty of tables and chairs provide comfortable dining under gently-turning ceiling fans, but if diners wish for more fresh air (and perhaps the intoxicating smells coming from the grill located just outside) there is a spacious and shaded patio just outside the Grange Hall, overlooking the fields of Morrison Farms to the south. Dining at the Grange Hall Barbeque just might be enough to convince you to join the Grange! Proceeding up the west side of State Fair, guests come across a classic spinner ride, the Caterpillar (circ.1925). At first glance this looks like a fairly sedate ride, with a circular train going around a gently undulating track. However, once this ride begins to pick up speed, something quite unusual happens- a curved green canvas canopy painted to look like a caterpillar is raised over the train from the inside edge of the ride. The riders are suddenly enveloped in near-total darkness, while to visitors watching the ride from the Midway it looks like the ride has turned into a giant caterpillar, racing around and around the hills and dips of the track. Inside the pitch-black train high-powered fans in the track occasionally blast air into the train to startle the already-disoriented riders. The Caterpillar is a classic ride sure to delight State Fair visitors. North of the Caterpillar is a row of traditional carnival games- Ring Toss, Shooting Gallery (no live bullets, regardless of historical accuracy), Balloon Darts and Roller Ball among others. These are not the nickel games of the Penny Arcade, but cost between $1 and $3 per play, depending on the game and prize awarded. These are still themed to be period appropriate for the State Fair of 1900, including carnival barkers loudly advertising their games to the passing crowds. Continuing north, visitors discover yet another classic ride, the Whip, first introduced in 1914. This ride is still to be found in several historic parks in America, and smaller versions designed just for children are even more common around the country. The Whip uses a series of turntables and cables to move cars capable of holding two to three persons along the straight sides of a rectangular platform, then whipping them around the turntables at each end. The constant variation of speed from the slow, sedate straight-aways to the "whip" around the turns make this a fun and slightly thrilling experience for families to discover together. 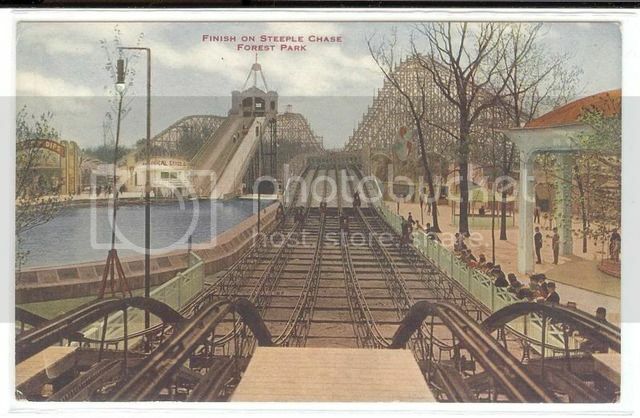 The Steeplechase was the heart, soul and namesake of Steeplechase Park in Coney Island, the most popular and successful of the Coney Island parks from 1897 until 1964. Part roller coaster, part carousel, part scenic railway, it was a ride unique in concept and design. Several times fire destroyed the Steeplechase, but it was always rebuilt, a "phoenix rising from the ashes", and once again Steeplechase has been reborn, this time at Americana 1900. The "Americana Steeplechase", the last attraction on the west side of State Fair is the signature ride at Americana 1900's "State Fair". This Zamperla- built coaster blends the launch motorbike technology of Pony Express at Knott's Berry Farm with the visual theming and ride experience of the only remaining example of an original Steeplechase ride, the Blackpool Pleasure Beach Steeplechase in Blackpool, Great Britain, to create a coaster experience unequaled by either of its forerunners. Guests enter the loading station, which resembles the grandstand of an impressive race track of 1900, white with tall, slender columns and a towering cupola with fluttering flags surmounting the roof. Passing through the queue area, guests pass signs and displays explaining just what a steeplechase horse race is, and how it differs from a regular horse race. A steeplechase is not run on a traditional track, but is a distance race where horses must jump over fences, hedges, ditches and water hazards. The name comes from early races when riders used a church steeple as a reference point to orient their location in the race. The multiple tracks and ride vehicle design is among the most technologically advanced in the roller coaster world. The Americana Steeplechase consists of eight parallel tracks, each approximately 2,000 feet long, that proceed side by side through a beautifully landscaped out-and-back course of forest and fields, over fences, hedges and streams and past a rural Southern church with a tall, landmark steeple. Each track can accommodate up to eight ride vehicles designed to look like sleek racehorses, similar to the horses on Pony Express at Knott's Berry Farm but much more sleek and streamlined, and are designed for two riders to be seated per horse, one behind the other. The horses are not in trains, as on Pony Express, but race against the other seven horses on the other tracks. It is a true horse race! In appearance, they closely resemble the racehorses on the Cedar Downs Racing Derby at Cedar Point. This arrangement of multiple tracks and horses allows for near continual loading and unloading of riders while others are racing, with up to 128 riders on the course at one time. Passengers mount their horse and sit on saddles with automatic restraints to hold the riders securely in their seat. The average duration of each race is 55 seconds. After being loaded and secured, the eight horses and their sixteen riders advance to the "starting line". When ready to be launched via the Zamperla flywheel and clutch system, a bugler trumpets the readiness of the horses, and "they're off", each horse reaching a speed of 38 m.p.h. in less than three seconds. The horses race each other over hedges and water hazards, around trees and barns, and take a high banked u-turn at the turnaround up to a height of 44 feet. Each track is designed to have the same distance to travel- since the inside tracks on the turn would be shorter than the tracks further out, extra hills or swerves around trees or other "natural" obstacles will be added to make each track have an equal length to the others. To add to the excitement of the Steeplechase, each horse also has a galloping motion built into its supports, so that the riders not only feel the speed as they surge forward down the track, they also feel the gait of the horse as it gallops down the Steeplechase course. Throughout the race, magnetic propulsion systems and brake sections keep the horses racing at full speed while ensuring safety and control of each horse. Coming into the final stretch, a final burst of speed is added to recreate the feeling of the horses pushing themselves to win the race. The winner is offered to pose for a complimentary sepia photograph of themselves wearing a victor's wreath. Other riders can also have their picture taken in the Steeplechase Photography Studio located in the exit, and can purchase an on-ride photo taken during the race. All photos are done in the sepia tones of the era, long before color photography was invented. Also available in this shop are Steeplechase-themed souvenirs, model horses, books and other appropriate objects to remember their thrilling Steeplechase race. Regardless of who wins, each rider of Steeplechase will have a winning experience on the most unique roller coaster in America. This completes our tour of the perimeter of State Fair, but that is not all there is to see and do. Occupying prime locations down the middle of the Township are three rides that are among the most memorable to ride and the most beautiful to view at State Fair. First, just south of Thunderbolt and Lightning are found the "Wright Flyers", where riders can "fly" aeroplanes inspired by the original Wright Flyer and other, more advanced planes they developed after their first successful controlled flight in 1903. It is an aerial carousel-type of ride with sixteen "aeroplanes", each of which can carry one pilot and one passenger. The pilots can fly their aeroplanes in three different ways, depending on how they operate the controls. As the planes begin to turn around the center of the ride and rise into the air, they can be controlled by the pilot to fly higher or lower, can fly in closer to the center of the ride or further out, and can actually roll slightly from side to side. The center of the State Fair midway is dominated by the Wonder Wheel of the South, a 180 ft. tall eccentric Ferris Wheel based on both the 1920 Coney Island Wonder Wheel and its predecessor, the Hermann Eccentric Ferris Wheel, patented in 1915 but never built. 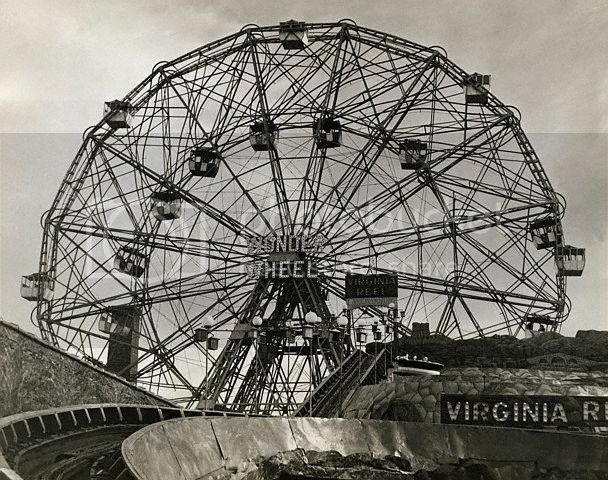 The Wonder Wheel of the South has thirty fully-enclosed cars, each capable of carrying six riders. Twelve of these cars are fixed to the rim of the wheel, while the other 18 are "sliders" and slide through fixed tracks between the rim and the hub. Each type of car, fixed or moving, is loaded from a separate loading platform, so that riders can chose the type of car they wish to ride in. The ride lasts about ten minutes, including loading and unloading the cars and several non-stop revolutions. The body of the Wonder Wheel of the South is painted a soft cream color with gold accents on the slider tracks. The hub is painted gold, as are the cars on the hub, with the slider cars painted a soft orange and the center axis a deep red. During the day the sunlight hitting the Wheel makes it look like a beautiful sunburst, while at night the lighting package of thousands of miniature lights makes it a breathtaking sight. One of only three eccentric Ferris wheels in the nation, the Wonder Wheel of the South is a must-do attraction at State Fair and Americana 1900. The final ride at State Fair is probably the most iconic ride at any fair, be it small town street fair, country fair or even State Fair- the Carousel. It is also one of the most historic carousels ever created. Built by Charles Looff (1852-1918), the most important carousel manufacturer of the late 1800's, the 1895 Looff Carousel is a fully-restored masterpiece of the Coney Island-style of carousel carving. The hand-carved wooden horses are slender, stylized, with elaborate trappings and spirited expressions. The seventy-eight Looff horses originally had real horse-hair tails (not reproduced here but replaced with more durable materials). With a diameter of fifty-five feet, this is one of the largest carousels ever built by Looff. 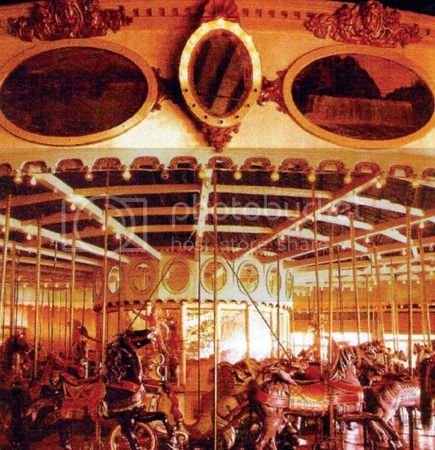 It originally stood in Palace Amusements in Asbury Park, N.J. until 1988, when the park closed and the carousel and horses were sold off individually. The historic frame is original, carefully restored with replacement sections only where necessary for safety and integrity of the ride. Many of the original horses have been returned, restored and replaced in their original locations on the carousel, with the remainder all original Looff creations purchased and returned from collectors all over the world. No carousel would be complete without carousel organ music, and the Looff Carousel uses a 1925 Wurlitzer carousel organ that has been completely restored and plays dozens of melodies appropriate to a carousel of this age and importance. Music was used both to add to the experience of the ride and to hide the noise of the machinery running the carousel, and the military marches and waltz music heard from this classic instrument provides the perfect background sounds for this carousel. "Our State Fair is a great State Fair!" 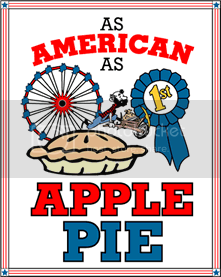 is the first line that Oscar Hammerstein II wrote for the opening song of his 1945 movie musical "State Fair", and no phrase is more true about State Fair at Americana 1900. The sight of dozens of forty-six star American flags and colorful banners flapping in the breeze, the floral smells of the decorative gardens along with the mouth-watering aromas of roasting meats at the Grange Hall, the sounds of the organ music from the Looff Carousel, the happy squeals, screams and laughter coming from the historic rides, and the thousands of lights that turn State Fair at night into a sparkling fairyland all combine to make a visit to this Township at Americana 1900 a memorable experience to be treasured for a lifetime. State Fair is truly "A Great State Fair"! Well, Chad did say "go hard or go home". I found out that there is a limit of how much you can put into a single post! That is why I had to continue it into the next one. I hope you took my suggestion at the beginning seriously and got yourself something to eat and drink before diving into it, and I really hope that you enjoy reading my proposal. It's like spending a day at the State Fair- with free admission! Bravo, Scott! I've been a fan of your park from the beginning. Please remember to book me a room at your resort hotel as one day would not be enough for the fun to be had at Americana: 1900! Scott E., I hate traditional midway/carnival areas, but yours transcends the genre and would be a must visit for the Rao Family on any vacation. The only problem I have with your post is that I do not know which attraction is your headliner - by my count there are at least three must rides, with five potentials. Obviously Steeplechase is your favorite and the one you wrote as the headliner, but I might like the Virginia Reel even better. Great job. Thanks, guys! I really appreciate that you like what I'm doing with my park. TPA is really a lot of fun, but wow is it a lot of work! Now I have to wait and see what Brett and Blake are going to propose. Both of them are really good at this! This is the home of Peter Pan, Captain Hook, and Tinker Bell. The land is comprised of six distinct locations in Never Land. The sections, in order from left to right, are Hangman’s Tree, Mermaid Lagoon, Never Land Bay, Skull Rock, Pixie Hollow, and Indian Camp. 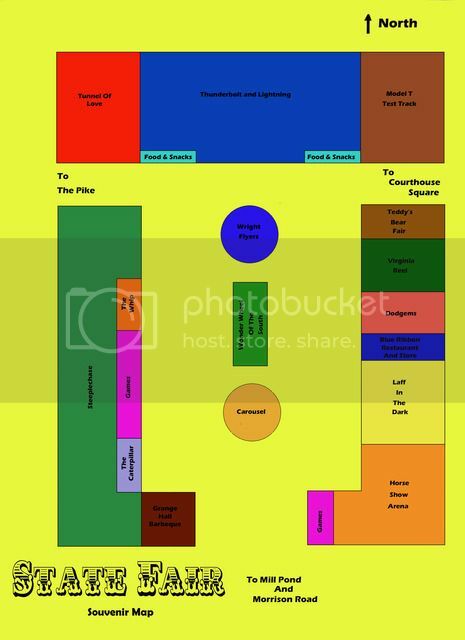 Each area has something to do for the guests. The main attraction for the land, Attack on Hook, can be seen from the front of the bay. Attack on Hook is an E-Ticket attraction with never before done technology. This is the first ever shooter ride to incorporate a swinging pendulum ride. The entrance is a mast and sail stating the name of the ride and the stand-by and fastpass line. The giant sail covers the gigantic show building; probably the largest Disney has ever built. The ride will have fastpasses. The queue weaves around trees, bushes, and other “magical” plants from Never Land. As the two lines merge into one, groups of fifty are led inside, into the preshow. As guests enter the preshow, the walls look like a giant map with the red lines going in every which way with “X’s” marking the spots of Never Land. As the doors to the preshow close, Peter Pan and Tinker Bell appear via projections on the wall in front. Peter Pan tells the guest that he needs their help to stop Hook from taking over Never Land. He makes the guests Honorary Lost Boys (and Girls) and explains they must take flight in newly built ships and use special Pixie Bombs to get rid of Hook and his pirates by going to all of the stops on the giant map on the wall. As he is saying all of this, he is flying across the room to the spots on the map. He sends the Lost Boys and Girls on their way and sends Tink to show them the way to the loading dock. Doors open to the left and the Lost Boys and Girls follow a path leading to the loading dock. Tinker Bell can be seen on the walls at different times as she is leading everyone to where they need to be. The vehicles are pirate ship- base and can fit 12 people, 6 on one side and 6 on the other. There are cannons in front of each seat with a button on top for the Lost Boys and Girls to send the Pixie Bombs out of it. As the ship leaves the loading dock, a projection of Pixie Dust comes over the ship so it could fly. Peter tells them to let the Pixie Bombs go, that you need to push the button in front of you. The first screen appears with special made targets to practice with. There is no swinging here…. yet. Peter tells everyone as they move to the next scene to look for the targets and special objects to make the pirates want to leave. As the ship pulls into the next scene, the ship starts to swing slightly as the Indian Camp appears. The scene goes on as you shoot at poles of tepees to make it collapse on pirates, hitting drums to bounce pirates in the face, and even bouncing in the face paint to get the pirates dirty with paint. The pirates leave and the swinging slows down for a second before the next scene at Skull Rock. At Skull Rock, the bombs bounce all over the walls, splash water everywhere, and also make fish fly into the faces of the pirates. The swinging gets crazier as each new scene appears. Next is Mermaid Lagoon where the waterfalls are moved forward by the bombs, more splashing of the water, and falling seashells all by the bombs. The next scene is Pan’s own home, Hangman’s Tree. The movement of the pirate ship is wilder than before as the bombs effect rocks flying in the air, the tree branches are coming to life, and trap doors are opening and closing and trapping pirates half in and out. As the ships leave the scene, Hook can be heard saying “I see, you want to play games, well, I can arrange that!” as you hear an anchor attach to the bottom of the ship as the ship flies to the final scene, the last stand on the Jolly Roger. This is where the swinging is the roughest and funniest swing in the ride. The bombs finish the fight with hitting of riggings, wooden beams, and pulling ropes. It ends with Hook ordering his crew to sail away and Tink helps out by putting her pixie dust on the ship to make it fly. Peter thanks everyone for their help and sends them the unloading dock. The Lost Boys and Girls get a button at the exit of the ride commemorating their time as a Lost Boy and Girl. Off from the left of the ride is Hangman’s Tree where you will find The Lost Boy’s Hideout. This is the largest playground in the world and is all underground, where the Lost Boys live and play in. Their beds are trampolines; there are giant vines as swings, and tree branches as monkey bars. This can even be used by adults wanting to relive their childhood. Off to the side of the many entrances to the hideout is Wendy’s Storybook Hideaway. This small stage is where Wendy tells children fairy tales and even new adventures of Peter Pan. Grown up Wendy appears first before asking Tinker Bell to help out and, with the help of Pixie Dust, turns grown Wendy into her the child she was. This will be a great chance for the parents to sit and rest while the children get to hear some new and favorite stories. Mermaid Lagoon is next door and is home to the shop Gifts from the Sea, a shop set as the mermaids’ treasure “vault.” There will be a lot Peter Pan merchandise that will be unique to the park. Guests will be able to dip their feet in the lagoon and there will be a scenic boat along the shores of the lagoon known as The Mermaid’s Tour, which will included a friend of the mermaids as your tour guide. The boat ride will go through caves and different rock formations that belong to the mermaids to learn who these beauties are. Skull Rock is on the other side, near the back of the land. The location is used for 2 purposes. The first is the Skull Rock Café, a counter-service dining option where guests can eat inside the rock formation and even eat at the same level as the eyes and look out across Never Land. The second is an attraction that is a guided tour through the caverns of Skull Rock called The Pirates of Skull Rock. A fellow pirate of Captain Hook will be your guide. There will be 3 different tours, each one about a different pirate who is one of the founders of Skull Rock. The first is Captain Hook, everyone’s favorite cod fish and pirate. The other two pirates are Captain Curly Beard and Captain Charlie Cud, 2 pirates who Disney created for this purpose. These pirates are said to be the Pirate Trio, 3 pirates who will band together in times of need, and also founded Skull Rock. The Magic Tree is where John and Michael hold Flying Practice. The ride, called Flying Practice is a traditional chair swing transformed to be a magical tree to teach people to fly. Once everyone is seated, Pixie Dust is poured on the tree and mechanisms to make everything fly. It is a fun diversion for all ages. Tinker Bell’s home, Pixie Hollow, is the next part of Never Land. There are basically 2 attractions and a shop. The shop is Tink’s Tinker Shoppe. This will sell Tinker Bell merchandise and other fairies from Pixie Hollow. One of the attractions will be Tink vs. Hook, a dark ride where Tink and her friends must stop Hook and his band of pirates from claiming Pixie Hollow as their own. The dark ride starts out at the entrance to Pixie Hollow and brings them to the Pixie Dust Tree where Tink arrives in a preshow set in the main hall of the tree. She explains to them that Hook has arrived and wanted to take all the Pixie Dust and claim Pixie Hollow as his new home. She sends the guests to the loading dock where carts made of nut shells, like the ones in the movies. The journey you take includes all of Tink’s friends, Silvermist, Iridessa, Rosetta, Fawn, Vidia, Periwinkle, and Zarina, taking their aim at Hook and his crew to scare them away from Pixie Hollow. It will be a fun ride for the family. The other attraction here will be a meet and greet for Tinker Bell and her friends. The one at Disneyland will move here. The Indian Camp is the last place on the right and includes tepees to crawl into and explore. The ride here will be a new version of the classic whip ride. The ride is called The Red Man’s Dance and will be 3 whip rides together on 3 tom toms. They are 3 individual rides that are synced together to go at once. This causes for more thrills because it is not one big ride but 3 smaller rides with a greater chance of a good whip around the corner. There is also a counter service restaurant that is called Red Man’s Outdoor Kitchen. This will serve more rustic food like roasted chicken and even a steak sandwich. There will be live entertainment here in the form of the Indian Camp Players. They will bring tales of Peter Pan interacting with the Indians on Never Land. Aquatica is the night time show equivalent to World of Color. A new song by Alan Menken called “Waterful World” will be the show’s anthem. It will explore the world of Disney movies that uses water both in a big way (Little Mermaid, Finding Nemo) to little (Princess and the Frog, Dumbo). It uses famous movies and scenes (Tangled, Peter Pan) to not so famous (Make Mine Music’s Blue Bayou, Home on the Range). It will use fountains, lights, color, fire, and sound to recreate Disney's “Waterful” and Magical world! This will be a great way to end your day at the renamed park, Disney’s Magical Worlds! Thank you for reading and good luck to the other competitors. I tried to add pictures but it was not working. Sorry about that and hope my words help to make the pictures clear. Tucked away, in an unfathomably ancient realm of imagination, lies Courage Cove. Courage Cove is a land themed after the action, adventure, and heroism which takes place on or near water. Pirates clash in a never ending battle for a mystical and magical ship, powerful wizards constantly fend off internal and external threats, and an ancient submerged city is under threat from those that would pillage it’s treasures. Welcome to Courage Cove! Courage Cove is nestled in the southern end of Realms of Imagination, lying south of Kingdom Hearts and west of New Carthage. Spanning over approximately 30 acres of land, Courage Cove offers guests a fantastic selection of attractions, dining options, and entertainment. Guests can access Courage Cove in one of four ways. The quickest and most comfortable way is to take the Realm Traveler and exit the Courage Cove station (the Realm Traveler is a scenic monorail transportation system that acts as Realms of Imagination’s main transportation solution). This will put guests on the southern end of Courage Cove. Alternatively, guests can access Courage Cove from two large walkways from Kingdom Hearts—one on the west and one on the east, respectively. Guests wishing to access Courage Cove from New Carthage can do so via a large corridor leading from the west end of New Carthage into the Eastern end of Courage Cove. The main thoroughfare through Courage Cove follows a large horseshoe or semi-circle shape. The thoroughfare’s semi-circle shape curves around the Cove itself, which takes up a large amount of land in the realm. Attractions, shops, and restaurants can all be accessed via the main thoroughfare or small streets and alleys which branch off from the main thoroughfare. The aesthetic of Courage Cove is that of ancient elegance and beauty, with a color palette emphasizing and enhancing the colors of the water—Rich blues, white and off-whites, deep greens, and subtle grays. Large domed buildings dot the cove. 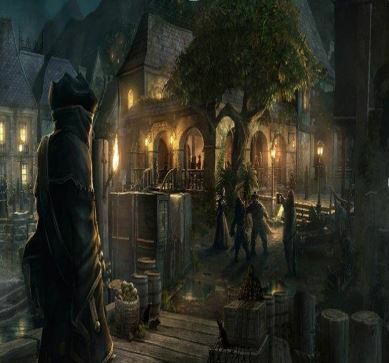 In many ways, Courage Cove resembles a bustling ancient port city. The city façade is made even more striking via the use of forced perspective which gives the city an appearance of being a steep multi-tiered village. A flair of the Middle-East encroaches upon the Cove as alleys and streets are covered over with large cloth and silk tarpaulins, which stretch overhead from one building to another, making small bazaars and street shops possible. 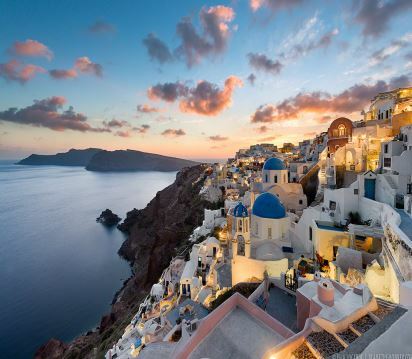 The Island of Santorini in Greece, the ancient city of Constantinople (now Istanbul), and the mythical island-nation of Atlantis serve as visual and aesthetic inspiration for the architecture and visual theme of the land. Courage Cove features three distinct landmarks. The first and largest of these landmarks is the Earthsea Archipelago. Courage Cove itself is acts as the staging ground for the Archipelago. The Earthsea Archipelago is a collection of small islands that dot the cove. A complex, interactive walk-through attraction, the Earthsea Archipelago, offers a unique interactive experience. The Archipelago itself features one main large island—the Island of Roke—home to the greatest wizard school in all of Earthsea. Branching off from Roke are a collection of smaller islands, each with their own unique features, experiences, and interactive elements. Further detail of the attraction itself will be included in the “attractions” section below. The second of the distinct landmarks is the temple of Atlantis, which towers over all other structures in the cove. 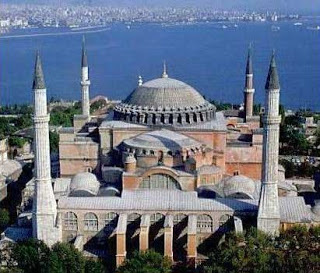 The temple is a large domed structure, closely resembling the Hagia Sophia chapel in Istanbul. Expansive domes of rich emerald green are guarded by needle-like minarets. The temple is located on the central southern area of the Cove itself. The third and final landmark are two large pirate ships, the Queen Anne’s Revenge and the Providence, docked outside of a large cavern which serves as the façade entrance to Courage Cove’s marquee E-Ticket attraction, Battle for the Black Pearl. The Earthsea Archipelago Adventure: Join the wizard academy on Roke Island and begin your journey as an apprentice wizard of Earthsea! This unique, one-of-a-kind walk-through attraction combines elements of high-tech video gaming and live action role-play throughout the expansive and interactive Earthsea Archipelago. In many ways a “Tom Sawyer’s Island 2.0”, guests will enter the academy on Roke Island to receive training on proper wizardry. Utilizing their heroic spirit, they will be tasked with a set of quests and challenges the various islands of the Archipelago offers. Challenges range from finding and retrieving ancient artifacts of great power, defeating dark shadow creatures, taming dragons, and much more! Quests and challenges can be generated randomly per day and guests can return to complete quests throughout multiple park visits, offering guests new and exciting reasons to continue to return to the Earthsea Archipelago! Atlantis Beseiged: The ancient advanced civilization of Atlantis has finally been uncovered on the ocean floor and the Society of Explorers and Adventurers (S.E.A.) has set out to investigate! Unfortunately for the S.E.A. and the Atlanteans, greedy spelunkers and treasure seekers are attempting to steal the priceless treasures of Atlantis at any cost! Board a personal, deep-dive submarine and journey to the bottom of Atlantis as you and the S.E.A. fight to defend the sanctity and beauty of Atlantis! This is a highly immersive D-ticket attraction which utilizes technology similar to the 20,000 Leagues Under the Sea attraction at Tokyo DisneySea. Guests board their submarine and “dive” down to the ocean floor, encountering all sorts of mysterious beasts of the deep before arriving at the sprawling underwater city of Atlantis. Once in Atlantis, the guests will be tasked with assisting the Atlanteans in their struggle to fend off greedy plunderers as they attempt to pillage Atlantis by any means necessary. Earthsea Keelboats: Embark on a tranquil and relaxing cruise throughout Courage Cove on these magical Keelboats. Utilizing LPS technology, these self-guiding “magical” keelboats take guests for a slow and steady cruise around the Earthsea Archipelago and Courage Cove itself, providing pre-recorded narration and soundtrack! Guests will travel around Courage Cove, receiving small informational facts pertaining to the various landmarks of Courage Cove. 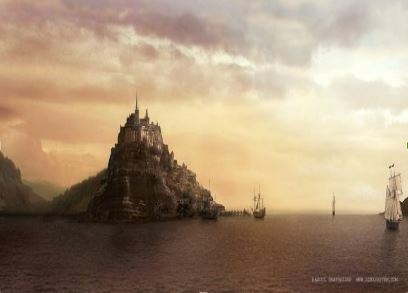 The Keelboats will even enter certain attractions such as the cavernous queue of Battle for the Black Pearl and the Tombs of Atuan which sprawl under the Earthsea Archipelago. A C-Ticket attraction. Silly Subs: Board your own personal submarine for a short and quick ride under the depths of Courage Cove! This ride is a unique twist on the classic flying spinner attraction Disney has made famous with rides such as Dumbo and the Astro Orbiter. The twist with this attraction is rather than flying above ground, guests are invited to enter a submarine to circle around underwater, ascending and descending at their leisure. The underwater circular spinner is themed with various animatronic fish and underwater life, which makes for a visually interesting ride experience. A B-Ticket attraction for riders of all ages! The Atlantean: An elaborately themed and high-class dining experience. Located within the Atlantis Temple façade and queue, this high-end restaurant offers unprecedented atmosphere with 5-star quality dining options. Food fare again emphasizes seafood options, with an emphasis on high-end dishes. Guests will be able to order coconut crusted Chilean Sea Bass, Mussell penne pasta with creamy mushroom Alfredo sauce, home-made paella, Halibut filet over a bed of garlic mashed potatoes, and various cuts of fish and steak. The restaurant itself is inspired by the famed Blue Bayou restaurant at Disneyland. The restaurant dining area rests inside Atlantis Temple. Guests are treated to a setting of opulent grandeur as the high domed ceilings are adorned with beautiful mosaics depicting various aspects of Atlantean life. Magical and mystical crystal energies come to life and bring various figures of the temple to life intermittently, such as the statues of the gods and the dome projecting eternal night with stars shooting across the sky and constellations changing slowly. Prices are steep, as most meals will include an appetizer and entrée. Appetizers are roughly $7-12 with entrees ranging from $17-30. Landlubbers: A quick-service restaurant located next to the Battle for the Black Pearl attraction, this marooned pirate ship offers standard American cuisine for those who don’t enjoy the tastes of the sea. The interior is themed to a hollowed out and marooned pirate ship as guests dine in the skeleton of the ship itself or they can opt to sit on the beautiful patio with a full-view of Courage Cove in their sights. Guests will be able to enjoy fresh burgers, fried and rotisserie chicken, pulled pork sandwiches, and veggie platters. Prices are moderate and range from $10-17. The Keelhaul: An expanded retail location next to Battle for the Black Pearl attraction, this store is themed in the classic Spanish villa style as taken over by pirates. The store itself sells pirate themed clothing, accessories, and trinkets. Guests will also be able to purchase special spirit stone holding weapons such as muskets, hand cannons, pistols, cutlasses, and pirate hats. Roke Symposium: Located on the Island of Roke, this store is elaborately themed to resemble an ancient depository of books of knowledge. It is here that guests will be able to purchase various maps, trinkets, and tokens which help enhance the immersion of the interactive game played in the The Earthsea Archipelago Adventure, including such valuable items such as a detailed map of Earthsea, complete with a list of quests and objectives arranged in a check-off list format for easy tracking and reference, unique spirit-stone holding devices specifically themed to Earthsea such as elaborate staffs, beautiful wands, and wizard robes. The Roke Symposium also features unique attire and clothing ready for purchase. Bayside Bazaar: This outdoor marketplace, which is located throughout the busy and bustling alleyways of Courage Cove, offers guests the chance to browse exotic and beautiful attire accessories such as unique scarves, leis, tunics, satchels and purses, and much more! For a little flair of the exotic, head to the bazaar! This concludes the overview of the beautiful and mysterious Courage Cove! The following post will detail Courage Cove's marquee attraction Battle for the Black Pearl. Type of Ride: Interactive Dark ride with a water based LPS system (vehicles are not fixed to a track and can ‘move freely’ throughout show scenes and buildings. Vehicles: Vehicles are made to resemble small rounded skiffs, giving the skiffs and almost raft-like appearance. Each vehicle can seat four passengers (2 in front and 2 in back). Each seat is adorned with a special interactive cannon which guests will use throughout the ride to interact with various elements of the rides and ultimately determine who will control the Black Pearl itself. Each seat has a location for spirit-stone uploading. Lastly, each vehicle features an on-board scoring display that allows the riders to track and asses their progress in during the ride. The rides goal is to beat the opposing riders scores and these opposing scores will be displayed alongside the riders scores so that they may have a visual aid in determining their progress in the ride. Whichever side scores the most points will claim the Black Pearl! Ride Duration: Approximately 5:30 Mins. Battle for the Black Pearl offers riders a unique feature in ride technology. Riders are offered a choice of two different unique tracks or ride variations, based upon their choice of which captain they will fight for (detailed below). While some scenes are shared between both “tracks”, some scenes are unique to a specific track or side. When presenting the scenes in the ride, I have decided to break the split scenes into Side A: Jack Sparrow and Side B: Hector Barbossa. Scenes which are shared between the two sides will be labeled as Joint Scene(s). The Facade, as discussed above, features a few unique elements. Firstly, two large pirate ships, the Queen Anne's Revenge and The Providence sit docked just outside of a large and intimidating cavern. Each boat appears ragged and beaten. 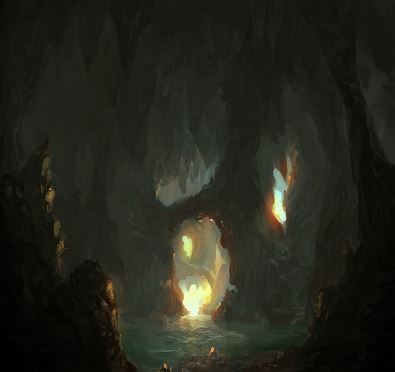 The cavern itself is large and ominous, as a large waterfall cascades over its front side, hiding everything inside of it in darkness. The queue proper begins outside of the facade itself. Guests enter on the queue on the right side of the cavern. As they enter the queue, they pass behind the large waterfall before the queue leads them right and further into the cavern darkness. Once well inside the cavern, various treasure rooms and armories can be seen, each hinting at the obvious struggle between two opposing sides as skeletons and abandoned weaponry can be seen scattered throughout the various caverns. In each seen, guests can hear the famous captains and their crews conversing about the Black Pearl and how best to obtain it as shadows of the talking crew are cast upon the cavern wall. Guests are then ushered by a cast member into one of three “parley rooms” (pre-show rooms). Each parley room is entered via a skull like rock formation. Inside veritable hoards of treasure and loot are gathered around the guests. A rocky shelf above the guests is dimly lit. As the pre-show is about to begin, a large boulder slams down, trapping the guests in the cavern. The pre-show involves a projection performance of Sparrow and Barbossa, each walking and talking on the shelf above the guests. They are involved in a parley, and each appeals to the guests as to why they deserve the Black Pearl more than the other. They each decide that whoever reaches the Pearl first will be deemed worthy of captaining the ship and agree to the terms of the agreement. The two captains then ask the guests to join their crew and fight for their side! Guests can choose to join Jack Sparrow and his crew or team up with the malicious Barbossa. Guests choose sides by exiting the pre-show room under their respective captain Jack standing over them on one side with Barbossa on the other. Guests then enter the final queuing portion, as the cavern opens up into an elaborate pirate den, complete with skeletons and treasure. Guests board the skiffs as they come through the darkness and enter the cave proper. Four skiffs per grouping of skiffs debark together, two skiffs for each side. Once all skiffs are full and ready to go, the ride begins. All four skiffs enter a large show building, which still resembles the large cavern the majority of the queue was housed inside of. Two sloops appear out of the darkness and cruise along next to the riders, one carrying Jack Sparrow and the other Barbossa. Each Captain instructs their guests in how to properly utilize their cannons (various light up targets located throughout the ride, much like Buzz Lightyear's Astro Blasters, or MIB: The Ride). Sparrow and Barbossa each make light of the terms of agreement, stating that there was nothing in the agreement that said they couldn't shoot or kill the other captain or their crew. Once the brief explanation is give, guests approach a large cluster of cluttered rocks with kegs of gun powder floating in the water. Barbossa and Sparrow instruct the riders to shoot the gun power to clear a path out of the cavern. When guests shoot the gun barrels, a large explosion clears the rubble as a large underwater water cannon blasts water high into the air. At this point, the skiffs break away into their first individual unique scenes. Side A: Jack Sparrow's side continues straight through the cleared rubble and into open waters while Side B: Hector Barbossa's side veers right into another cavern. Side A: Jack Sparrow: Sparrows skiffs flit out into the open ocean, a dark cloudy twilight light overhead. To the left of the skiffs a large and imposing fortress begins firing at the skiffs, as cannonballs land dangerously close to the skiffs. Jack Sparrow can be seen hiding in a small grouping of fronds just outside of the fortress. He instructs guests to fire at the fortress, claiming that Barbossa's men hold the fort and crippling their position and firepower will help them in finding the Pearl. Guests fire at the fortress, various interactive elements occuring with each landed shot such as exploding gunpowder barrels, falling turrets, apparent 'fires', and shadows of men falling down and retreating. Side B: Hector Barbossa: Barbossa's skiffs duck into another small cavern network. This one full of various weaponry and treasure. Barbossa appears atop a pile of gold and instructs the riders to cause as much destruction as possible, as this is Sparrow's personal armory and treasury. Guests will then begin peppering the cavern with cannon shots, causing piles of gold coins to explode everywhere, cannons to implode, guns to come crashing into the shallow cavern water, and all sorts of other types of mayhem. Joint Scene: The skiffs are then brought together for the second time as Sparrows skiffs are turned around and enter a large pirate port city. They enter a narrow canal as barbossa's skiffs come barreling out of the cavern to come alongside Sparrow's skiffs in another canal as the canals run parallel to each other. The port city itself resembles a debauched Caribbean port, full of spanish style villas and bamboo and reed huts and bungalows. The city is riddled with dueling pirates, each proclaiming allegiance to either Jack or Barbossa. The skiffs turn to face their respective enemy skiffs and begin a canal battle. They are tasked with shooting various enemy pirates, as well as interactive objects such as bridges which collapse dangerously close to the skiffs, unlucky shops and merchant carts which fall prey to the destruction the riders and pirates are causing. Side B: Hector Barbossa: Barbossa's skiffs enter under the fortress via a small arched opening. Once inside, Barbossa again appears as the enter, dangling from a large beam. He instructs the riders to open the dungeon cells and release his men so that they may join in the fight. The riders are tasked with blasting open the cell doors before the opposing skiffs can cause cave-in's. Each successfully breached cell will allow more men to escape and join back with Barbossa. The skiffs then exit the fortress and join the opposing skiffs out in the open waters. Joint Scene: The skiffs are back out on the open waters again as a thunderstorm begins to loom and thunder above them. Barbossa and Sparrow again appear in their respective skiffs as the weather becomes worse. Suddenly, the skiffs face each other and begin to circle around each other in a quick clockwise motion as the water between the skiffs begins to churn and swirl and become a dangerous whirlpool. As the skiffs spin, Barbossa and Sparrow trade insults and instruct their respective riders to shoot the enemy skiffs. The skiffs light up targets then light up and for each hit a skiff receives their skiff will be spun around wildly. Finally, as the skiffs are about to be sucked into the whirlpool, the skiffs are shot out in different directions and plunged into total darkness. Side A: Jack Sparrow: As the stormy clouds part and the skiffs begin to slowly cruise through the open waters, the water suddenly becomes alive with activity. Faint Bioluminescene can be seen stirring below and Jack Sparrow in his own personal skiff warns of Mermaids. The Mermaids begin to leap out of the water in attempts to attack the skiffs. The riders are tasked with fending off the mermaids as they attack their respective skiff. 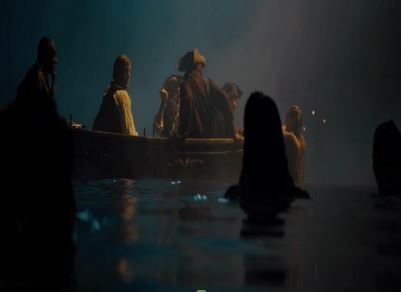 Side B: Hector Barbossa: Similar to Sparrow's skiffs, Barbossa's crew enter what appear to be tranquil waters. 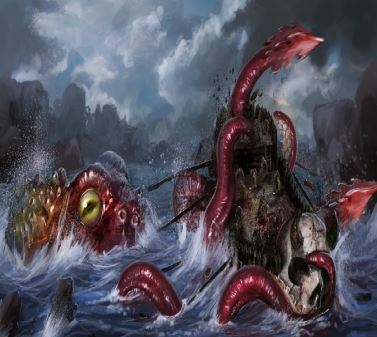 That is until a deep rumbling and rushing of water drenches the riders as a large tentacled beast emerges from the depths. It's a Kraken! Barbossa quickly instructs the riders to aim for the tentacles as they flail wildly around the skiffs, grasping for the riders. Riders must fend off the Kraken's attack as it attempts to drag them down under the depths. Joint Scene: After fending off the terrors of the deep, the skiffs then again merge one final time as they enter a large show building. Two huge Galleons flank the sides of the riders, it's the two galleons from docked outside the facade—Barbossa's Queen Anne's Revenge and Sparrow's The Providence. The skiffs turn to face each other and begin to square off, each one attempting to inflict as much damage to the enemy ship as is possible. In the distance, the imposing Black Pearl waits ominously with its ragged black sails. 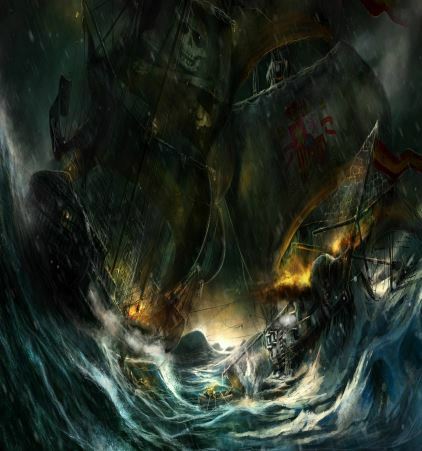 The galleons are alive with conflict as each galleon suffers massive damage; men being thrown overboard from canon fire, splinters of ship breaking apart all around, and the lingering fog of gun powder making the battle seem that much more chaotic. After the fight, each skiff turns to face the Black Pearl, firing again at each other in a last ditch effort to claim the right to the Pearl. The winning team enters the barge of the Pearl, complete with captain and crew and congratulate and thank the riders for their worthy fighting skills. They ensure the riders that they will use the Pearl to pillage only the finest villages, and seek only the greatest of treasures. The losing team's skiffs veer off and away from the pearl. Again entering a small cavern while their respective Captain tells them to shake it off as they'll be sure to get the Pearl back someday. The winning team exits the Black Pearl through the barge and enters the same small cavern as the losers. The cavern itself serving as an unloading dock for all riders. Once off the skiff, riders descend back through the cavern towards the exit. Before exiting, riders can e-mail a picture with their respective score to themselves, as well as score some spirit-stone achievements. A shop themed as if it is carved within the cavern itself serves as a final exit point, offering various ride-specific merchandise and attire. -Fight for both Sparrow and Barbossa in Battle for the Black Pearl--Unlocks the achievement Double Agent as well as the skiff for use in the Disney Infinity Toy Box. -Claim the Black Pearl while fighting for Sparrow—Unlock the achievement, A Good Pirate (if there ever was one). -Claim the Black Pearl while fighting for Barbossa and Sparrow, respectively—Unlock the achievement, I'm the real Captain, they just don't realize it as well as the Black Pearl for use in the Disney Infinity toy box. This concludes my entry for Courage Cove! This week has to be the toughest week yet. I’ve made certain assumptions about each of the entries as to the landmark and non-ride attraction, please let me know if I have anything wrong. Scott E - State Fair. I got to admit, I was prepared not to like this. As I think I said in the entry round people won’t travel huge distances to ride a bunch of flat rides they could ride at home. But, you’ve clearly not fallen into that trap, you’ve provided a land full of rides and experiences that are true to the time and theme whilst making it a unique experience the visitor cannot get at home, or anywhere else. Thunderbolt and lighting, which I have presumed is your landmark feature on first read promises to be a great ride. Whilst others may snub coasters which don’t have crazy loops, corkscrews, etc. For my money you simply cannot beat a classic woodie. The only criticism I have is I’d like to see a little more “landmark” out of it (even if this isn’t your landmark). A classic woodie by its very nature has a huge footprint, so is certainly a landmark, but I’d have suggested something to give it more… At Luna Park Melbourne the “Scenic Railway” marks the walls of the park, I’d suggest something like this perhaps, or a mountain, or someting more. But it is very good in its own right. The Tunnel of Love is a good addition, the forerunner of the current Dark Ride. You may also have wanted to consider an “around the world” version (such as still runs at Blackpool Pleasure Beach) that takes guests to far off places… It might be a little more marketable to 50% of your guests. The model T test ride is a great thematic inclusion. Predictable perhaps, but would have been notable if it was absent. The inclusion of animals is a tough one. On one hand, you have to make sure you distinguish this area from Morrison Farm, but the judging of animals is core to the Agricultural show/fair experience. I think you got a good compromise with your horse show. The penny Arcade looks like a load of nostalgic fun, and surely would generate an all ages crowd. I have ridden the Steeplechase at Blackpool (A great romatic ride to ride with the one you love, both on the same horse). This is a classic ride that should be recreated in more places, and I’m glad to see you include it. You however seem to have taken this up to 11 with up to 8 tracks and a good long length. having read everything you plan, I’m no longer sure if this, or Thunderbolt/Lighting is now the Landmark. If you head to the final, make sure you get the gremlins sorted out for adding photos. They make it so much easier to understand the concept, and help control your flow. Also make sure you learn how to use the Bold tag so you can highlight where the next attraction starts. I don’t specifically mark “down” for not having these, but where I find it easier to read and understand an idea, I’m more likely to mark “up” having fully grocked the concept. Attack on Hook seems to be a good “Ride” but you haven’t given me much to think of it as a “Landmark”. The Matterhorn, for example, is a ride and a landmark because it dominates the space, I’m not really getting any idea how this looks from the outside to act as a landmark. I’m not sure I understand the mechanics of it, but it does seem to be a fun ride. I like the idea of including Wendy in the way you have especially with the inclusion of fairy dust, but it seems more library than theme park. I’d suggest making this the intro to a “show”, there seems to be a lot you can do with this idea. Captain Hook’s revenge seems to be a fun show, but Aquatica seems to break from the immersive experience you had spent paragraphs creating… I couldn’t really see how it it linked into anything before, it just seemed tacked on the end. Overall though, still very good. I think out of all the competitors, you got the idea of “Landmark” part of the challenge the most. Its clearly a spot that will stand out, and is a great attraction on its own. I also like the idea of choosing a side, increasing the “return value” of the ride. However, when it comes to the non ride attraction, I’m unsure how to mark. I don’t see any shows or other experiences that could be seen as a non-ride attraction except perhaps the EarthSea Archipelago Adventure… I’m not sure if a Walk-Through or high tech playground counts as a “ride” or not. Give that you’re having to use footpower, I’ll err on the side of calling it a ride. Adding all the interactivity certainly adds to this area, and you’ve certainly made it re-visitable by changing the daily quests. Your supporting attractions are good, and well themed, but I’m kinda left wanting more… It might simply be that the other contestants seemed to include more attractions, but you were still well past the minimum requirement. Like the others, very Good. Thanks, Chad. I understand the uncertainty of which was my landmark ride. It's like choosing a favorite child. T&L is the most classic, Steeplechase is the most high-tech, Virginia Reel is the most unusual. Maybe the entire land should be considered a "landmark"? I really tried to find a wide variety of classic rides that are both fun and important, and had to leave a lot of rides out that I wanted to include (Tilt-A-Wirl, Octopus, walk-through fun house (mostly because so many of the old walk-through funhouses were just plain dangerous, with tilted floors, human roulette wheels, rotating tunnels that today would never be allowed by insurance much less state inspectors!). I've also been on Steeplechase at Blackpool, a long time ago, and I thought it was one of the most fun rides I have ever been on- not fast or thrilling, but really unique. I'm not sure why so many judges keep saying that they are prepared not to like my park! Maybe it is for the best- it pushes me to work that much harder to make it the best I can do. I'm having a great time doing this, even if I am not getting much sleep! Chad, I'm going to publically demonstrate my ignorance. How do you do the bold tag? Italics? It seems like when I type them out in my proposal, then paste it into the thread, it reverts to this same old font. What am I doing wrong or not doing at all? Never mind, Chad. I think I got it figured out. First off, all three of you did an excellent job in this challenge. This was the hardest round to judge, and I think any of you are qualified to participate in the final. Unfortunately, only two will be able to proceed to the last round of the competition. Scott (State Fair): Once again, you have gone above and beyond with your proposal. An area themed to the State Fair is an excellent fit for your park. You have chosen to make the Americana Steeplechase the signature attraction of your area, a good choice given the unique nature of the attraction. You have done an excellent job of modernizing the attraction while keeping the same concept of the original and have created one of the most unique family coasters anywhere. I'm not sure how much the galloping would benefit the attraction, and I really think you should go with a magnetic launch if you'll also have magnetic boosters during the ride, but overall it's a great attraction. Thunderbolt and Lighting could just as well have been the signature attraction of the State Fair, and this would likely be the biggest draw of the area. I'm disappointed you opted for another RMC creation when a more traditional GCI or Gravity Group design would be an outstanding fit here (especially when the coaster pictured is a traditional woodie), but overall the coaster sounds very good and, though a bit bigger than coasters of the golden age, another excellent fit for the area. The remaining rides all complement the area nicely and include attractions not commonly seen in theme parks today, such as the Tunnel of Love, Laff in the Dark, and the Caterpillar, along with classics such as the Whip and Carousel. I would have liked to see one or two more high-thrill rides, as other than Thunder and Lightning everything is geared toward families and mild thrills, making the coaster feel a little out of place. For your non-ride attractions, your horse show sounds both entertaining and educational, not just for the younger set but for anyone who likes animals, and it would be very difficult to resist dropping a few nickels in the Penny Arcade (especially when it is donated to charity). Both of your dining locations are good, as is your main retail location (Teddy's Bear Fair). Overall, you have created an excellent area that provides all the fun of a State Fair without any of the sketchiness commonly associated with such events. While I've been thinking of your park more as a regional park than a destination park (think somewhere like Holiday World), if the entire park is the quality of the State Fair you've probably got the most popular non-chain park in the US on your hands. Side note: For modifying text on this site, use html tags. For example, bold text would be <*b>text here<*/b> and italics <*i>text here<*/i> (remove the asterisks to enable the tags). Formatting done in a text editor, such as Microsoft Word, is lost when the document is transferred to the site. Brett (Never Land): Never Land is one of the iconic worlds from Disney's classic animated films, so creating a theme park land based on that is a good choice. I like your decision to split the area into several sub-areas, each based on a distinct part of Never Land. Attack on Hook sounds like a fun dark ride, but I'm not quite sure it would be a landmark or signature attraction of your park. To me, this sounds like a cross between Toy Story Midway Mania and Peter Pan's Flight, both of which are great rides, but neither of which are really a major reason to visit their respective park. I'm also worried the swinging vehicles would put off a lot of people, as your description sounds like a miniature pirate ship ride on a track. Combine this with the interactive elements and the ride duration (there's a reason most flat rides typically use cycles around 2 minutes) and motion sickness is very likely. The other rides in the area are good fits, with a couple C/D ticket dark rides and a couple flats. Although it fits the movie, you might want to think of a different name for the Red Man's Dance (as well as some changes to the Indian Camp in general), to avoid the racist stereotype typically associated with the movie. Your non-ride attractions, particularly the Lost Boy's Hideout and Tinker Bell meet and greet, would be appealing to kids, and the Skull Rock tour is fun for all demographics. While Captain Hook's Revenge is a good show, you haven't specified whether it will have a theater or use regular walkways for viewing. If it's the latter, I don't think it would be worth the crowd control hassle to have the show, especially if it's performed several times per day. Aquatica doesn't fit the Never Land theme at all and shouldn't be included here (plus it needs a new name unless you want a lawsuit from SeaWorld). Your dining and shopping locations sound well themed but relatively basic. Overall, this is a nice themed area, though it seems to be missing a signature attraction and with crowd control issues caused by Captain Hook's Revenge it may not be all that popular. That said, for fans of Peter Pan or Disney's animated classics this is a must visit area and it has some very unique offerings compared to what has been done at the rest of the Disneyland Resort. Blake (Courage Cove): Courage Cove is an excellent fit for your park. The sea is one of the earliest settings for tales of fantasy and adventure, so having an area themed to it is absolutely necessary. Since you've structured your proposal backwards from the other competitors, I'll review everything else and then discuss your landmark attraction. Your area has three distinct landmarks, each of which serves as a visual draw. However, I have a feeling guests may be disappointed by the lack of attractions in such a well themed setting. Excluding your headliner, Atlantis Besieged is the only ride that has a strong appeal. Yes, Earthsea Keelboats would be nice for a relaxing break, but nobody is going to go out of their way to ride it, and Silly Subs is novel but mainly for kids. Your non-ride attraction, the Earthsea Archipelago Adventure, sounds like a very fun attraction with tons of interactivity and very high replay value. All three of the dining locations in your area are great, and you've got an excellent mix of offerings to please everybody. The three primary retail locations are great fits for the area as well and offer a wide range of souvenirs. Now for your headliner: Battle for the Black Pearl. I honestly have a hard time imagining any existing interactive attraction could be better than this. The queue and preshow are excellent, and the choice of fighting for Sparrow or Barbossa is a great twist that fits perfectly with the films. Since the choice has meaning, as the ride is different for each captain, it also increases the value of multiple rides. Without going into excessive detail, the scenes in the ride all sound great and would be some of the most detailed Disney has ever pulled off. I like the interactive elements and especially like how one team's actions affect the other team even when both are in separate scenes. Done properly, this could easily be one of the best attractions Disney has ever created. My biggest complaint is probably the lines, as a capacity of 1,200 per hour just wouldn't cut it for a Disney E-ticket (most are in the 2,000-2,500 range). Overall, this is an excellently themed area that is lacking a bit in attraction offerings but excels in all other aspects. Battle for the Black Pearl guarantees that Courage Cove will be perpetually busy, but it needs a bit more to do so the area can handle the crowds. Good luck to everyone in this close competition. >>>> I've also been on Steeplechase at Blackpool, a long time ago, and I thought it was one of the most fun rides I have ever been on- not fast or thrilling, but really unique. On my last visit I took my Canadian Girlfriend... I had half a mind to write some sort of post on "Romantic Rides", but never quite got around to it... But Steeplechase was definately the king of the romatic ones. Its definately unique. Blackpool still has a lot of the old classic rides - 3 Woodies, an "Around the world" dark ride, and more.... I'd love to see a park that could act as a theme park museum as well as a theme park... Maybe Americana is the way. Well, you have certainly thought this out incredibly well. You have lots of interesting attractions, and a solid mixture of rides that are a “blast from the past”, and rides that should intrigue and excite audiences of all ages. Basically, that’s a loquacious way of saying it’s good. Your concept of steeplechase is intriguing, and having not visited the original, I cannot compare. I think your “Tunnel of Love” may turn guests away. Despite the actual, well created attraction it is, when I first heard it, I immediately thought of a cheesy pink and white tunnel with Swan boats going through it. The “Model T. Test Track” is a fun idea, but perhaps needs a name change. There is already a theme park attraction named Test Track. Your restaurants are both excellent, and delicious, fits for the park. The “Virginia Reel” is a nice wild mouse coaster, but nothing people haven’t seen before. Which brings me to my main point. Your land lacks any really original attractions. Everything here, while maybe changed in some way, has been done before. Even the Wonder Wheel has been done before, and the fact that it was done by an “enterprise park” makes it seem unoriginal. But, overall, you have a fun land that I certainly would want to visit. Well, personally, I’m not a fan of the “sub-areas”. They make the land far too complicated, and make the whole thing look like the pitch of a complete theme park. A bit more decryption of your Mermaid Ride would be welcome. I have no idea what happens during the ride, besides the tour, and I assume more must happen than that. While I’ll buy into using “Indian”, Red Man’s Dance, while relevant to the movie and it’s source material, is completely inappropriate in a modern setting. Given the overall failure of Peter Pan 2, perhaps a show is a bad idea. Or, perhaps it is a great way to get people re-interested in the movie. It could easily swing either way. Also, if I remember correctly, your park is at Disneyland. Having two nearly identical nighttime shows at one park is by no means a good choice. Finally, I think this land needs more attractions. More specifically, more quality ones. You seem to be a bit lacking. But, overall, a fun area for fans of the movie, and the Disney Classics. I’m not totally sure you’ve hit the nail on the head with the landmark thing. Not only was your ride not a physical landmark, but nothing in the ride really stood out to me either. Now, your ride seems like a ton of fun, but I’m not sure people would visit your park just to see it. Dude, where do you find this “concept art”? It really looks legitimate and fits your land perfectly. I would have liked to see a map though, just to give me a better visual of how things are laid out. “The Earthsea Archipelago” seems unique, but I fear that much like Tom Sawyer Island (1.0), it will eventually become mostly abandoned. Earthsea Keelboats and Silly Subs both seem mediocre. And, with a typical flying, spinning type ride, the whole appeal is a different view of the area, which the Subs doesn’t give you. Your restaurants are good, and mostly fit the land. However, “Landlubbers” doesn’t need to be there. If people don’t want the type of food that makes sense, they can simply go to a different land. Or, you could change the name, which might let it fit in better. All in all, a fun land, but that needs more quality attractions. This, Blake, is an amazing ride. It takes up space with its facade, in a beautiful way that you could use to actually advertise your park, which is part of what I wanted from a “landmark”. The two different sides as well as the interactive elements ensure that re-rides will be as fun as the original. You do have relatively low capacity, but perhaps you could have two separate rides. Disney has the money for that kind of thing. Also, I think it is a very cool idea that what the other group does affects you, even when you are not in the same scene. Overall, awesome ride. Very few bad things to say. Good luck to all of you, and I can’t wait to see what comes out of the final round! Sorry for my delays too! This was all very good and it was a super busy week for me! I will keep it short! Blake M. I liked your theming with Peter Pan. Interesting in seeing your land work out. Your attraction was pretty good, but it did remind me of Peter Pan's Flight. Still, I would ride it! Brett- The interesting thing is that I thought your land was only so so (very similar to a new Adventureland), but I thought your attraction was pretty special! I liked the Pirates of the Carribean ideas, with guns! Weird how that worked out! DPCC, clearly Scott's headliner was Steeplechase as everyone else noted, however, Thunderbolt and Lightning could also be considered a headliner because it is a "big" ride. I thought the same thing when I first read his post. But sometimes the biggest, baddest ride isn't the headliner. Regardless, Scott, Brett, and Blake, you three are tremendous talents. If I ever come into $1B I am hiring the three of you to imagine my park - and AJ to design my coasters. Great work! ...and see if he might be interested in collaborating on a map of your parks. Anthony--I'm a little confused on your ranking as you seem to have mixed up my proposal with Brett's. Not to question your authority or rankings, but are you sure you scored this week appropriately? I'm sorry for my mess-up. I was forced to do everything this week rather quickly. I don't have the time to re-write the critique, but I thought it over, and it does not affect my rankings. I'm posting The Final Shortly.